Special Orders, Design & Mfg. "Mr. Marcel Gazeryan understood my objectives immediately and provided me with excellent advice. When he showed me the completed enamel piece, I was ecstatic with the craftsmanship and elegant finish. The completed diamond pin went on to win an award in the competition. . . "
Your jewelry designs and projects are welcome. 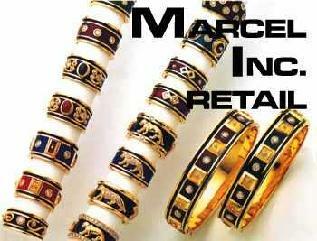 Marcel serves clients with their designing and manufacturing needs. the drawing board to the final finished product. are available to the trade. Exclusive one of a kind and quantity projects are welcome. About Marcel........ Marcel Gazeryan's father tutored him in making jewelry and the fine art of enamelling, beginning at the early age of 14 when he worked during school vacations and holidays. His jewelry career spans thirty years and includes experience in Pforzheim (Germany) jewelry industry and porcelain center of Limoges, France. Marcel's expertise also extends to the restoration of estate and antique enameled pieces servicing clients in Europe and the U.S. He creates his own designs and maintains his own special formulas of enamel colors (family recipes, so to speak), that are not available on the commercial market.